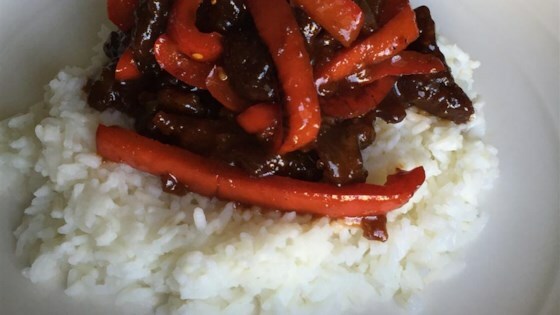 "I've never found a recipe for crispy ginger beef like the ones in the restaurants. I have experimented, and found something pretty close. Serve with rice and some steamed veggies." Meanwhile, in a mixing bowl, combine cornstarch, salt and pepper together. Mix thoroughly. Toss the steak slices in the cornstarch mixture and coat well. Deep fry the coated steak slices until golden brown. Check to make sure they are cooked through. Remove from oil, and set aside. In another mixing bowl, combine the soy sauce, rice vinegar, rice wine and honey. Add sugar, chili paste, water, and ginger. Mix well and set aside. Heat a wok or deep frying pan over medium high heat. Add 1 tablespoon of oil, and quickly saute the onion, garlic and red pepper for 30 seconds. Add the sauce mixture, and cook another 30 seconds. Finally, add the strips of fried steak and toss to heat through and coat with sauce. See how to make a healthier version of orange beef. I liked the sauce more than the meal. This was just "ok" but it is doubtful I will make it again. This recipe gets two thumbs up! I was surprised at how similar it tasted to restaurant style crispy beef...It's quick and easy, even for amateur cooks like myself.